It is official: I am working part-time for The Bellingham Herald. Yep. Working on Saturdays covering a variety of assignments. © Paul Conrad/The Bellingham Herald – Western Washington University short stop Haylee Baker (18) tags out Northwest Nazarene runner Whitney Carlton (6) to begin a double play in the top of the 7th inning on Saturday morning April 19, 2014, in Bellingham, Wash., during the first game of a double-header at Western Washington University. The Vikings won 7-4. My first was the Western Washington University women’s fastpitch game. The next was the 2014 Ralph Vernacchia Invitational, the third was the Bridge of Aloha Hawaiian cultural event, and the fourth a prep baseball game Nooksack Valley versus Lynden Christian High Schools. © Paul Conrad/The Bellingham Herald – Western Washington freshman Mackenzie Hughes (3), slides safely into 2nd base as Northwest Nazarene senior Shelby Johnson reaches for an errant throw during the bottom of the fourth inning at Western Washington University in Bellingham, Wash. The Vikings won 7-4 in the first game of the double-header. Working the deadline, filling in on assignments feels pretty good. Still figuring out the workflow, but that’s minor. Seriously though, It feels good to be back working in journalism, even if it is just a little. Hard work and tenacity do pay off. © Paul Conrad/Pablo Conrad Photography – Western Washington junior Logan Myers of Olympia, Wash., launches during the start of the Men’s 110 meter hurdles the 2014 Ralph Vernacchia Track and Field Meet at Civic Field in Bellingham, Wash., on Saturday April 26, 2014. Meyers came in second with a time of 14.69 seconds making it a new personal best. 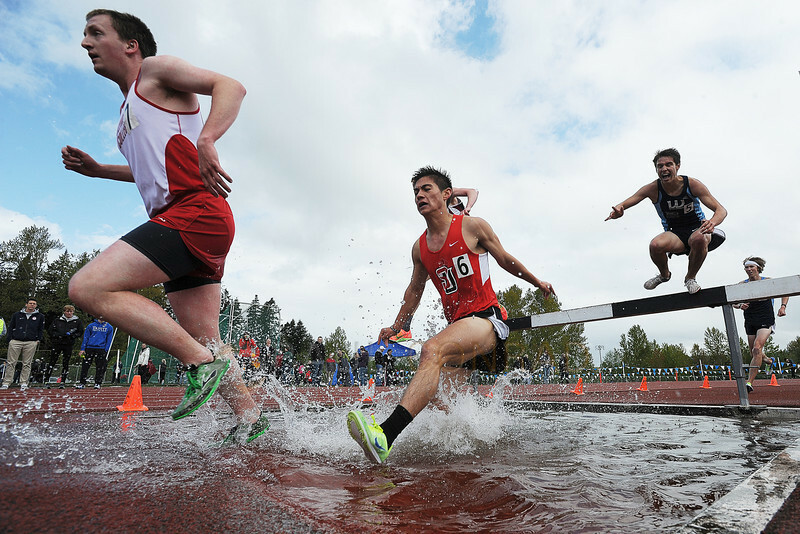 © Paul Conrad/The Bellingham Herald – Olympic College’s Keith Ryan, left leads Seattle University’s Nathan McLaughlin and Western Washington University’s Noah Ripley as they tackle the Men’s 3000m Steeplechase during the 2014 Ralph Vernacchia Track and Field Meet at Civic Field in Bellingham, Wash., on Saturday April 26, 2014. McLaughlin came in fourth with a time of 9 min. 42.72 seconds. Western Washington’s Matt Lutz won with a time 9:24.95 with WWU’s Joshua Reitner on his heels earning second with a time of 9 min. 38.58 seconds. 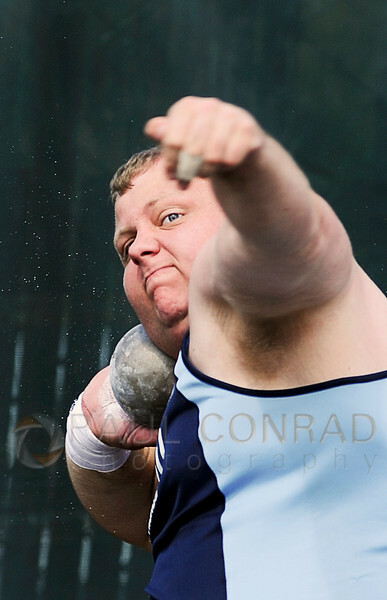 © Paul Conrad/The Bellingham Herald – Western Washington University senior Andrew Knight of Puyallup, Wash., begins his approach during the Men’s Shot Put at the 2014 Ralph Vernacchia Track and Field Meet at Civic Field in Bellingham, Wash., on Saturday April 26, 2014. Knight fouled out of the competition. 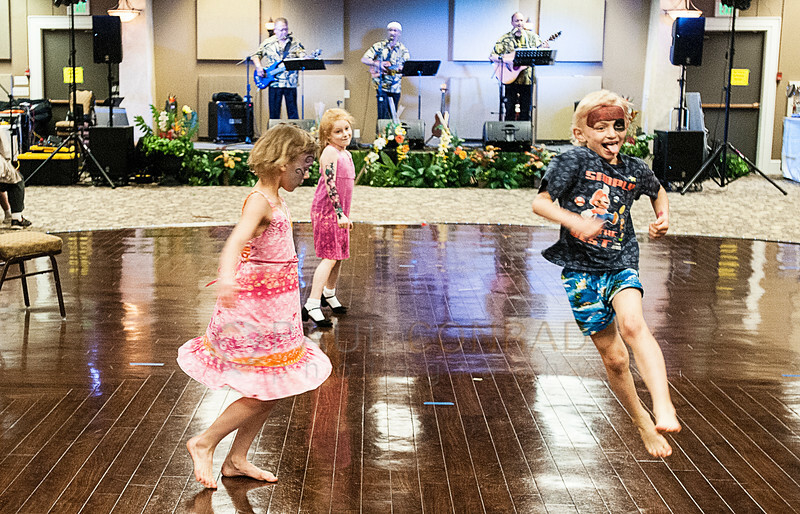 One of the more difficult assignments was the 3rd annual Bridge to Aloha celebration at the Ferndale Events Center in Ferndale, Wash. Not that it was difficult to shoot, but it was darker than I would have liked it to be. © Paul Conrad/The Bellingham Herald – Pua Age (cq), 15, of Lake Forest Park, Wash., dances with the Hula O Lehualani dance group during the 3rd annual Bridge of Aloha Festival in Ferndale, Wash., at the Ferndale Events Center on Saturday afternoon May 3, 2014. The festival is a celebration of Hawaiian traditions and dances. Not only dark, but there wasn’t a lot going on. Before the event, I shot the birthday party of my friend Milagro’s niece: Xindi’s Cinco. As I arrived late, I missed some cool happenings. One was a workshop on how to construct a leia and grass skirt. © Paul Conrad/The Bellingham Herald – Lexi White, 9, left, Emma Caires, 6, and Corban White, 7, all from Bellingham, dance to the music of Elias Kauhane (cq) during the 3rd annual Bridge of Aloha Festival in Ferndale, Wash., at the Ferndale Events Center on Saturday afternoon May 3, 2014. The annual festival is a celebration of Hawaiian culture. This is one of those assignments that make you stretch yourself and try new things. As I was taught by some of the great photojournalists: There are no bad assignments, only bad photographers. So I had to stretch myself pretty taut and come up with enough images for not only the paper but the online gallery as well. © Paul Conrad/ The Bellingham Herald – Likalani Tackett of Everett, Wash., leads the line of Hula O Lehulani dancers during the 3rd annual Bridge of Aloha Festival in Ferndale, Wash., at the Ferndale Events Center on Saturday afternoon May 3, 2014. Spring sports at high schools are coming to a close. It’s playoff season. This past weekend I covered the Nooksack Valley v Lynden Christian playoff game. 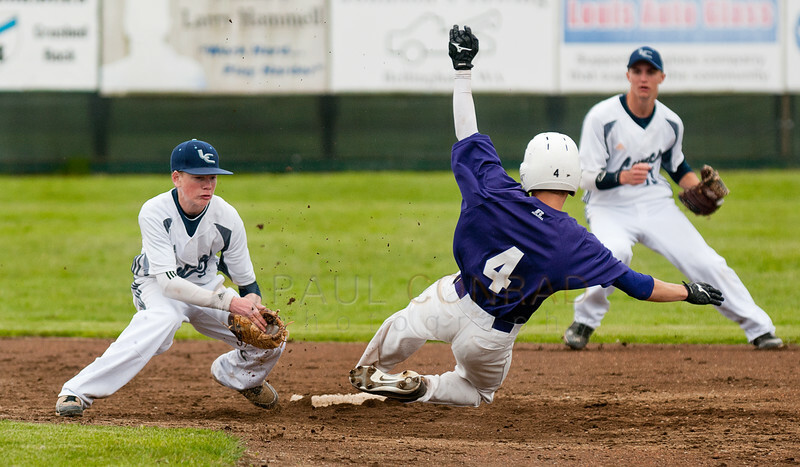 © Paul Conrad/The Bellingham Herald -Nooksack Valley’s Ryan Gelyvicks (4) begins his slide into 2nd base as Lynden Christian short stop Marc Meenderinck attempts a tag during the first inning on Saturday afternoon May 10, 2014, in Laurel,Wash., of the District 1A baseball tournament at Meridian High School. Gelyvicks was called out. Nooksack Valley defeated Lynden Christian 4-2 in seven innings. © Paul Conrad/The Bellingham Herald – Nooksack Valley pitcher Dalton Biehle (6) pitches against a Lynden Christian player during the second inning on Saturday afternoon May 10, 2014, in Laurel, Wash., during the District 1A baseball playoffs at Meridian High School. Nooksack Valley defeated Lynden Christian 4-2 in seven innings. © Paul Conrad/The Bellingham Herald – Lynden Christian short stop Marc Meenderinck (6) bobbles the ball as Nooksack Valley pitcher Dalton Biehle (6) slides safe into 2nd base in the third inning in during the District 1A baseball tournament at Meridian High School on Saturday afternoon May 10, 2014, in Laurel, Wash. Nooksack Valley defeated Lynden Christian 4-2 in seven innings. Baseball is fun to shoot for me because it can be challenging. In need of a photographer to cover your event? Game? Or other Needs? Contact me at Paul Conrad Photography to let me know what you need.